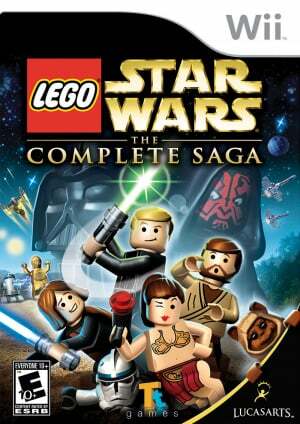 Sorry, no review of LEGO Star Wars: The Complete Saga yet. Building on the success of both LEGO® Star Wars™ “block-buster” videogames, LEGO Star Wars: The Complete Saga enables families to play through the events of all six Star Wars movies in one videogame for the first time ever. Developer Traveller’s Tales takes full advantage of the unique capabilities of all three nextgeneration consoles, while also adding new characters, new levels and new features. Players can build and battle this fall on the Wii™, PLAYSTATION®3 computer entertainment system and Xbox 360™ videogame system from Microsoft. Traveller’s Tales is also creating an entirely new Nintendo DS™ version, developed brick by brick from the ground up. New playable characters like Watto, Zam Wessell, Boss Nass and more bring the total count to over 120. ** For the first time, every Prequel Trilogy character – even those without the Force – can build, as well as jump into and out of the vehicles they create. ** Redesigned “Mos Espa Podrace” and “Gunship Cavalry” levels now encourage the open vehicle gameplay of LEGO Star Wars II. ** New bonus levels and 10 additional Bounty Hunter Missions offer new challenges in the Prequel Trilogy. ** Xbox 360 and PLAYSTATION 3: The LEGO Star Wars premiere of online two-player co-op lets families play together from anywhere in the world for the first time. ** Xbox 360 and PLAYSTATION 3: New high-resolution LEGO models and characters, along with new environment graphics and special effects, create visuals unparalleled by any other LEGO galaxy far, far away. ** Wii: Motion-sensitive inputs give you exciting new ways to control your LEGO Star Wars characters. ** Nintendo DS: Created from the ground up by Traveller’s Tales, this version incorporates exclusive touch-screen action and challenges. This Game is VERY rich in content. It has tons of collectibles and is essentially a double game! If there is one Lego game you should have in your collection, this is the one. In lego starwars, why can you only go up to 4,000,000,000, points? Just placed an order for this game on Amazon. Can you skip the prequels? Those don't count. isitorange - Actually you can. You only have to beat the first level of Episode I then you can go on to any episode. I really do enjoy this game. I prefer the DS version just because it's such a "pick up and play" casual game for me. Highly recommended for Star Wars fans like me. The DS version is rather better than the Wii version. I love the DS version alot!!!!!!!!!!!!! I give the DS version a 9/10. I am shocked by what the staff did at Game Informer, they reviewed a third-party title onky on the Wii, when the would usually trump PS3 and Xbox 360 over the Wii. Now this is and oddity (Not the game, what Game Informer did).